If youre at all like me, you grew up with the LP as your primary format for commercially available music. Other formats have come and gone, including 8-Track tape, cassette tape, DAT, CD, DVD-A & V, SACD, and now Blu-ray. Some were skipped over so fast they were barely blips on the radar, and some lasted a while but eventually fizzled out. Two, CD and DVD-V, are still hanging on while two more, LP and SACD, have become strong niche products. Blu-ray? Well, the jurys still out on that one. These days there is a new format climbing steadily up the ranks -- digital downloads. They offer many benefits, such as no physical media to take up precious space in our crowded homes. Downloads also offer the opportunity for music on demand -- if you want to hear it, you visit a website and download it, anytime day or night. No more sorting through stacks of LPs or CDs until you find what you want and then play it with a special player. Plus, you can create play lists to hear only what you want without having to change discs or sit though songs you might not care for. So whats not to like? Well, nothing really, unless youre an old curmudgeon like me. Ive reached the point in my life where change becomes harder and harder to accept, especially when Ive spent a lifetime building a music collection that fits both my sonic and financial requirements. Plus, I kind of like my LPs and CDs for the artwork and liner notes. I also like having something tangible to hold and admire. But downloading looks to be the wave of the present and future, what with the cost being lower due to not having to make any sort of disc and its companion artwork, and both high-resolution and multichannel audio either here now or on the horizon. I already have a laptop packed with music that Ive ripped from my CDs for my iPod in my iTunes library. Therefore, all I really need is a way to go from the laptop's USB output to the RCA inputs on my preamp. A quick Google search unearthed more suitable devices than I would have thought available. However, most cost more than I would want to spend, at this point in time anyway. That was the case until I discovered High Resolution Technologies, maker of the MusicStreamer for a miserly $89.95 USD. It has a USB input on one end and a pair of analog outputs on the other. Its biggest selling point, after its low price, is its size: a mere 2 1/8"W x 4 1/8"L x 1 1/4"H. That would make it extremely small and unobtrusive while still possessing the necessary features. High Resolution Technologies refers to the MusicStreamer as "a high-performance music interface that allows a computer and a home-entertainment system to become perfect partners." 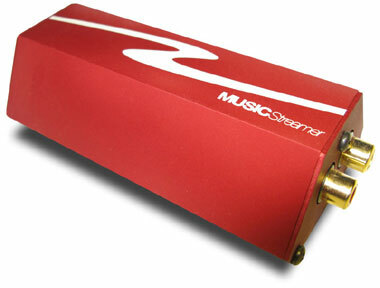 The MusicStreamer derives its power from the computer's USB port, so you dont need an outboard power source. The company claims it "completely regenerates power for all internal circuitry using a sophisticated set of proprietary circuits." An e-mail to High Resolution Technologies was answered by, of all people, Kevin Halverson of Muse Electronics, a company that has been designing well-respected digital players and power amplifiers since 1989. Kevin is the chief technology officer for High Resolution Technologies, so it appears that this company has a fair degree of design sense behind it. His reply indicated that the MusicStreamer uses a Texas Instruments PCM1744 digital-to-analog converter. Texas Instruments makes fine DACs, though this one is on the lower end of the scale to help keep costs down. But its inclusion here demonstrates that Halverson intends for the MusicStreamer to perform far above its modest price. Of the specifications for the MusicStreamer, the one that matters most for the application Im discussing here is its bit depth -- 16 bits, which makes its output the equivalent of Red Book-CD quality. No high-resolution audio here, which is rather ironic for a product from a company called High Resolution Technologies. The MusicStreamer has a USB 1.1 connection, which I find a smart move because it allows older laptops to be used as music servers. Connection was pretty straightforward. The only fly in the ointment was that I had to go into the Windows Control Panel to tell my computer to use the MusicStreamer as the audio card. It wasnt a big deal, but a hitch to keep in mind. Having now had the chance to listen to the MusicStreamer connected to my main system with a generic USB cable and a length of Analysis Plus Solo Crystal single-ended interconnect going to my preamp, Ive come to a new appreciation of both the ease of use of a computer-based system and the sound of this little inexpensive DAC that was giving access to my computer's music library. How did it sound? Pretty good, pretty darned good for only $90. I set my iTunes to shuffle play, kicked back and began to enjoy the music. Wow, this was the best radio station Id ever heard! It only played music that I wanted to hear. No, the sound wasnt quite as polished as that of my 25-times-as-expensive CD player, but the MusicStreamers shortcomings were more subtractive than addictive in nature. Plus, the music sounded far better than any FM station in my area. In particular, the MusicStreamer's top end was a tad soft, with a distinct lack of air. Bass also was soft and a little more ill defined than Im used to, though still deep enough to satisfy. But the midrange was excellent. Vocals in particular were very well handled. They were reproduced as solid and fully fleshed out. Acoustic guitar also sounded natural, abundant with both plucked-string and wooden-body sound. There was a good sense of soundstage width, a bit less in terms of depth. Image placement and solidity were on the upper end of the scale. All in all, this was an impressive showing for such an inexpensive product. While the MusicStreamer may not be where many audiophiles stop on their journey into computer-based audio, I can see where it might be as far as some will either need or want to go, so well does this little box aid in the reproduction of one's music library. This old dog can still learn a new trick or two. The MusicStreamer was just the ticket to a fine source of music -- music that I fully enjoyed as much as any CD in my collection. Plus, the ease of use, the almost instant access to whatever I felt like listening to was addictive. While not the last word in resolution, the MusicStreamer allowed me to experience many of the benefits of computer-based audio. And if you're so inclined, High Resolution Technologies offers the MusicStreamer+ ($249.95) with a more expensive TI DAC (the PCM1794), a lower noise floor, and higher signal-to-noise ratio for presumably a more audiophile-approved sound. If youve been holding off giving the rip-and-download scene a go due the cost, check out the High Resolution Technologies MusicStreamer. It may open up both your ears and your living space.